In 1642 a Dutch expedition led by Abel Tasman made the first European contact with Aotearoa. Tasman named his discovery Staten Land, believing that it might be part of the Staten Landt discovered in 1616 by Le Maire and Schouten off the southeast coast of South America. However, on his 1645 world map, Joannes Blaeu renamed it Zeelandia Nova (New Zealand), perhaps to match New Holland, as Australia was then called. In 1769, on a mission from the British Royal Society to explore the South Pacific, James Cook (1728-79) moored in Poverty Bay, New Zealand. Immediately, Cook and his men had violent encounters with the local Maori, but during the following weeks trading began. Within a month, Cook and his men took possession of New Zealand in the name of George III. In his six months there, Cook charted and wrote notes on New Zealand, which he soon learned consisted of two islands and was not a continent as he had assumed. Cook's writings formed the basis for reports to the British Crown, and some of the material eventually appeared in London newspapers. In 1840, the founding document of New Zealand was signed. The Treaty of Waitangi was signed by 45 Maori chiefs and representatives of the British Crown, including Captain William Hobson and several English residents. This document extended authority to the Crown over parts of both North and South Island. In the twentieth and twenty-first centuries, the treaty has been increasingly important in terms of the law, politics, and mass media coverage. Past breaches of the treaty have been corrected with restitution, and the treaty has been used successfully to lay claim to intangible assets, such as segments of the broadcast spectrum that as of 2002 had been allocated to Maori groups for their own radio and television services. The Maori was the main ethnic group in New Zealand when the Treaty of Waitangi was signed. Population numbers ranged from 200,000 to 250,000, but by the twentieth century swamped by the land hungry British colonists and the outbreak of European diseases, the Maori population had dwindled to 42,000. In the 1990s, the Maori population began to increase and the native language and media outlets were being revived. As of the early 2000s, the literacy rate in New Zealand was very high with 99 percent of total population (3,864,129) over the age of 15 able read and write. English and the aboriginal language Maori are both official languages of New Zealand. The ethnic categories were as follows: New Zealand European, 74.5 percent; Maori, 9.7 percent; other European, 4.6 percent; Pacific Islander, 3.8 percent, and Asian and others 7.4 percent. Approximately 67 percent are Christian (of those, 24 percent are Anglican), and the remaining 33 percent are indigenous or other. As of 2002, about 80 percent of the population lived in urban areas. As of the early 2000s, New Zealand had a parliamentary democracy with a judiciary system based on English law. It also had special land legislation and land courts for the aboriginals, the Maoris. New Zealand has no written constitution in the form of a single document but rather uses a number of Basic Laws, one of which is the Treaty of Waitangi. New Zealand has several political parties. As of 2002, they were: the ACT, New Zealand; Alliance (a coalition of the Labor Party, Democratic Party, New Zealand Liberal Party, and Mana Motuhake); the Green Party; the National Party (NP); the New Zealand First Party (NZFP); the New Zealand Labor Party (NZLP); and the United New Zealand (UNZ). In one sense, print culture began in New Zealand when Captain Cook wrote about the islands and sent his reports back to England. Much later, the colonialist Thomas Bracken, a publisher, editor, and author of New Zealand's national anthem, formed the New Zealand Paper Mills. Like printers in other British colonies, he worked under British government oversight and censorship. in Hamilton, Wellington (New Zealand's capitol), and Christchurch, two Sunday papers, and many provincial papers. Other allied news monitoring bodies included the Newspaper Publishers Association, the New Zealand Press Association, the Newspaper Advertising Bureau, the Advertising Standards Authority, the New Zealand Press Council, and the New Zealand Journalists Training Organization. Daily newspapers are numerous in relation to population size. As of the early 2000s, there were 26 daily newspapers, of which 18 were evening papers, nearly all of them published in provincial towns and cities. Of the eight morning dailies, the Auckland-based New Zealand Herald had the largest circulation of about 200,000 copies daily. In provinces the largest paper was Hamilton's Waikato Times with a circulation of 40,000. Other daily newspapers had circulations ranging from about 2,400 to about 100,000. On a typical day more than 1.7 million New Zealanders over the age of 10 read a newspaper, and New Zealanders spend approximately $4.0 million per week on their daily newspapers (including Sunday papers). Moreover, there are a significant number of a afternoon newspapers, which is against the international trend shifting to morning newspapers in order not to conflict with popular evening newscasts. The two Sunday newspapers, the Sunday Star Times and the Sunday News , were as of 2002 both published by Independent Newspapers Limited (INL) and then distributed nationwide. The Sunday Star Times , a broadsheet, had a 2000 paper circulation of nearly 200,000. In addition, New Zealand had 120 community papers, many of which were tabloid style, and at least 700 magazines published in New Zealand along with about 4,000 imported ones. The ten largest papers are, in order, the New Zealand Herald (210,000); The Press , owned by INL (91,000); The Dominion , another INL property (68,000); The Evening Post , also INL (56,000); Otago Daily Times , owned by Allied Press (43,000); Waikato Times , owned by INL (41,000); Hawke's Bay Today a Wilson and Horton property (31,000); The Southland Times , INL (30,000); The Daily News , INL (26,000); and the Bay of Plenty Times , Wilson and Horton (21,000). These papers are all broadsheets with an average cost of US$0.45. The three most influential newspapers are the New Zealand Herald , The Press , and The Dominion . Since 1984 the government has accomplished major economic restructuring, moving an agrarian economy dependent on concessionary British market access toward a more industrialized, free market economy that can compete globally. This dynamic growth boosted real incomes, broadened and deepened the technological capabilities of the industrial sector, and contained inflationary pressures. In the early 2000s, inflation rates remained among the lowest in the industrial world. Per capita gross domestic product (GDP) was moving toward the levels of the big West European economies. However, New Zealand's heavy dependence on trade leaves its growth prospects vulnerable to economic performance in Asia, Europe, and the United States. With the 2000-2001 budget pushing up pension and other public outlays, the government's ability to meet fiscal targets depended on sustained economic growth. 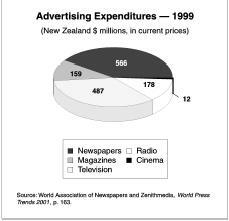 Over all the New Zealand media industry was healthy and in the process of recovering advertising revenue which dipped following September 11, 2001. 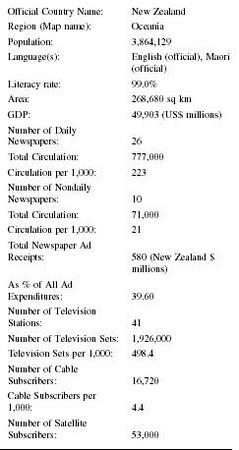 In the early 2000s, the majority of New Zealand's newspapers were owned by two large groups, Independent Newspapers Limited (INL) and Wilson and Horton Limited. INL also controlled the major Sunday papers. Allied Press of Dunedin, which owned six papers, was a distant third. Moreover, almost all metropolitan and provincial newspapers across New Zealand were foreign owned by groups with headquarters in Australia or Ireland. emerged from the Wellington Publishing Company (WPC) that was founded in 1906 to publish Wellington's morning daily, The Dominion . In 1970 WPC made a successful takeover bid for Truth (NZ) Ltd., and the following year it acquired Independent Publishers Ltd., owner of the Waikato Times . In 1972 Independent Publishers Ltd. took over Blundell Bros. Ltd., publisher of Wellington's Evening Post . Later that year the company changed its name to Independent Newspapers Limited. Over the last two decades of the twentieth century, INL bought up other papers, for example, the Evening Standard , the Southland Times , and the Timaru Herald . It bought Tara-naki Newspapers Ltd. and part of NZ News Ltd., which included the Auckland Star (eventually closed), the Sun day Star , and the Suburban Newspapers (Auckland), New Zealand's largest group of free community newspapers. In 1993, INL acquired the Nelson Evening Mail . By the new millennium, INL owned more than 80 daily, Sunday, community, suburban, and weekly newspaper titles, magazines, and specialist publications and was itself part of News Corporation of Australia. The largest regional newspaper publisher, Wilson and Horton, had 58 percent of the New Zealand newspaper market. It published 8 paid regional newspapers and over 30 free community newspapers. The company operated in four key areas: newspaper publishing; new Internet-based media; specialist publishing (including two leading weekly magazines); and commercial printing under the umbrella of its subsidiary, W & H Print Ltd. Wilson and Horton are part of the global media company, the Irish based Independent News & Media, which operates in Ireland, United Kingdom, South Africa, Australia, Asia and Europe. In addition, community newspapers in New Zealand are usually owned by individuals, families, or by small companies. In 1909, Sir Harry Britain, the brainchild of the Commonwealth Press Union, successfully organized the first Imperial Press Conference. Soon afterwards, he founded the Empire Press Union, which then later became the Commonwealth Press Union (CPU). As of the early 2000s, membership included over 1,500 newspapers and news agencies from 49 British Commonwealth countries. CPU's objectives are to uphold the ideas and values of the Commonwealth and to promote, through the press, understanding and goodwill among members of the Commonwealth. The union also wants to advance the freedom, interests, and welfare of the Commonwealth press and those working within it by the monitoring and opposing all measures and proposals likely to affect the freedom of the press in any part of the Commonwealth. The union also works to improve facilities for reporting and transmitting news and training of media personnel. It is not, however, a bargaining agent on behalf of journalists. In addition, the New Zealand Engineering, Printing and Manufacturing Union (NZEPMU), as of 2002, was New Zealand's largest union, representing 52,000 workers in 11 industry sectors, including postal and telecommunication workers. This union has a tradition of supporting training and education in related fields. In New Zealand, with its strong traditions of freedom of the press and freedom of speech, there are still several legal areas that influence the mass media. Some of the laws relate to copyright, defamation, contempt of court, breach of trust, regulations on the reporting of Parliament and their committees, and finally laws regarding freedom of information (openness). Many of these areas are also affected by the evolving common law traditions of the nation as they apply to the media and journalists. The New Zealand Bill of Rights contains a brief reference to press freedom in section 14: "Everyone has the right to freedom of expression, including the freedom to seek, receive, and impart information and opinions of any kind in any form." Also, as of 2002, five pieces of legislation had both direct and indirect bearing on press laws: the Official Information Act 1982; the Local Government Official Information and Meetings Act 1987; the Broadcasting Act 1989; Defamation Act 1992; and the Privacy Act 1993. The Official Information Acts of 1982 and 1987 can force the release of much information held by central and local governments. But a privacy act prohibits the release of personal information about individuals unless prior approval of the individual(s) is obtained. Violating these laws can lead to civil or criminal penalties, monetary damages, and various injunctions. Also, some of the measures apply to the owners of the media, while others apply to journalists themselves. In New Zealand the Newspapers and Printers Act of 1955 required all newspapers to be registered with an agent of the national government. In addition the media need to take into account the 1962 Copyright Act, the 1963 Indecent Publications Act, the 1986 Commerce Act (that affects mergers), and a series of amendments to these acts. These laws notwithstanding, New Zealand had at the beginning of the twenty-first century one of the most open and free presses in the world. There was no censorship. When people disagreed with the print press they had recourse to the compliant procedures of the New Zealand Press Council. In 2000 this Council heard and reviewed a compliant by the Auckland Jewish Council about some letters to the editor dealing with Judaism and decided against the compliant by endorsing a free press philosophy even when the views are extreme. The Council also ruled on a filing by the Monarchist League against an opinion column that claimed that the very rich royal family was taking money from the public purse. The Council also dismissed this complaint stating the a free country needed to rely on the competition of differing ideas. From as early as 1858, custom agents regulated the import of "indecent" material. Decisions were based on local whim and legislation that was in force at the time in England. In 1892 New Zealand witnessed the first act specifically aimed at censorship, The Offensive Publications Act of 1892 . In 1910 the Indecent Publications Act introduced the possibility that a print publication could be judged as having "literary, scientific, or artistic merit." A problem arose with the application by government and the interpretation by the courts. This new act remained in force until 1963 when the Indecent Publications Act was passed. This act created New Zealand's Indecent Publications Tribunal (IPT), which in effect removed censorship from the public service. The five members of the IPT were appointed and then empowered to examine and classify books, magazines, and sound recordings. 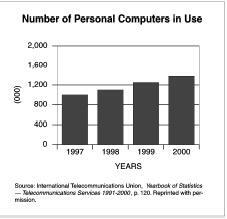 The IPT was subsequently replaced by other legislation. As of the early 2000s, New Zealand Press Council (NZPC) was completely funded by the publication industry. The five media representatives were appointed by the newspapers (2), the union (2), and the magazines (1). Journalists were appointed by their organization, the New Zealand Engineering, Printing and Manufacturing Union.A panel that included the chief ombudsman appointed public members. The Press Council's main objectives were to consider complaints against newspapers and other publications, to preserve the established freedom of the New Zealand Press, and to maintain the character of the New Zealand press in accordance with the highest professional standards. The New Zealand Press Association (NZPA), an organization cooperatively owned by New Zealand's daily newspapers, provides a wide variety of local and international news through cooperative news-exchange arrangements between newspapers in New Zealand and international agreements with Reuters, Australian Associated Press (AAP) and other news organizations around the world. Members of the Newspaper Publishers Association (NPA) represent all paid and Sunday newspapers in New Zealand. The Association advises members and coordinates their interests in areas such as government affairs, advertising standards, employee relations and human resource management, sponsorship, newsprint purchase and supply. While the central government subsidized the national radio and television networks, such as TVNZ, it attempted to distance itself from any type of editorial control by establishing various boards aimed at keeping the networks objective. Also following the 1999 election of a Labor government, a number of laws favoring unions were reintroduced and a number of labor disputes occurred. For example, the New Zealand Herald in Auckland as well as the Wellington-based New Zealand Press Association, its national news agency, experienced work stoppages that eventually led to new collective agreement. In the early 2000s, foreign correspondents had free access to New Zealand's media and the issues concerning the country. The government supported the Western free press position in accord with UNESCO's mass media declaration. Journalists were welcomed to travel about the country and conduct their work with openness and freedom. CanWest Global, an international media company based in Canada with extensive holdings print and electronic media across Canada as well as global media investments in New Zealand, Australia, and Ireland, had as of 2002 extensive holdings in New Zealand. The company owned 100 percent of TV 3 and TV 4. With TV 3 the company sought to be the preeminent sports network in New Zealand, providing, for example, extensive coverage of cricket and rugby. In New Zealand CanWest also controlled all of MORE FM, the top rated commercial network, and RadioWorks NZ, the second largest radio group in New Zealand operating four national radio networks through 27 local radio stations. New Zealand's five metropolitan newspapers joined forces as Met Pak to offer a comprehensive range of package buys. National advertisers used them to achieve nearly any campaign objectives they chose. The five metropolitan newspapers in this agency included the following cities: Auckland, Christ-church, Dunedin, and Wellington (with two papers). As Regional MAX, New Zealand's regional newspapers banded together to offer advertisers over a million potential regional consumers. The agency offered customers a choice of four packs with the maximum flexibility among their 17 Regional MAX dailies. The service was free, and it provided fast access to planning and costs with only one phone call. The newspapers take advantage of significant savings. There are several newspapers that belong to Regional MAX. The World Association of Newspapers (WAN) was also located in New Zealand. As of 2002, WAN, which began in 1948, consisted of a group of 71 national newspaper associations, individual newspaper executives in 100 nations, 13 national and international news agencies, a media foundation, and 7 affiliated regional and worldwide press organizations. The Association represents more than 18,000 publications on five continents. Its major goals include promoting freedom of the press and its economic independence. The association also fosters global communication and helps newspapers in developing countries through training and other cooperation projects. Finally, the Association channels legal, material, and humanitarian aid to victimized publishers and journalists. New Zealand's first radio broadcast was accomplished on November 17, 1921, by Robert Jack of Otago University in Dunedin. Before that point, radio listeners in New Zealand received broadcasts from other countries, notably the United States. The first set of broadcasting regulations was issued in 1923 under the Post and Telegraph Act of 1920. Under these regulations the country was divided into four numerical transmission regions: the North Island as far south as the Bay of Plenty, the rest of North Island and Nelson province in the South Island, South Island down to Timaru, and the rest of South Island. In 1925 the Radio Broadcasting Company (RBC) began to operate. Between 1927 and 1929, the RBC began to set up relay stations in provincial towns and in country districts. In 1932 the New Zealand Broadcasting Board (NZBB) acquired RBC's assets. The NZBB, a government department, was then put in charge of New Zealand's broadcasting services. In 1936, newly elected New Zealand prime minister Michael Joseph Savage committed himself to broadcasting and thus the National Broadcasting Service (NBS) was established. A government department, NBS only remained in control until the establishment of an independent body, the New Zealand Broadcasting Corporation (NZBC), in 1962. In 1976, Parliament changed the NZBC's name to the Broadcasting Corporation of New Zealand (BCNZ). With the name change came other separate entities, the company known in 2002 as Television New Zealand (TV NZ), Radio New Zealand, the New Zealand Symphony Orchestra (NZSO), and the New Zealand Listener (the country's largest circulation weekly magazine). Then in 1982 came the testing of FM stereo transmission. In 1988 the Broadcasting Corporation of New Zealand was replaced with two state-owned enterprises, Radio New Zealand Limited (RNZ) and the Television New Zealand Limited (TVNZ). The Broadcasting Act of 1989 established the Broadcasting Commission (NZ On Air) and the Broadcasting Standards Authority. It provided for election broadcasting and restricted the scope for political intervention in the management or programming of TVNZ or RNZ. The Broadcasting Act of 1989 also set up standards and objectives that would be overseen by the Broadcasting Standards Authority (BSA). In 1991 the limits on overseas shareholdings in New Zealand broadcasting companies were removed, and then the Broadcasting Amendment Act of 1993 was established to provide funding to promote Maori language and culture through broadcasting. The funding agency, Te Mängai Päho, has primary responsibility for the allocation of public funding for Maori broadcasting. It supports Maori language programming on TVNZ, radio stations and some Maori radio programming available on a networked basis. In 1999, some $8.6 million was allocated to Maori television and an additional $8.1 million was allocated to Maori radio. The money helped fund 20 Maori radio stations and a range of programs. 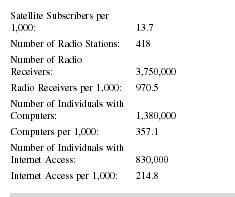 Since the broadcasting reforms of 1988-89, the number of registered radio frequencies increased substantially. The Radio Communications Act of 1989 established a market-based system for spectrum management, with up to 20-year tradable spectrum access rights. Such rights encouraged investment in spectrum use and provided for situations where a number of users were possible. All spectrum access rights are allocated by auction. The registration of licenses following allocation establishes the tradable right, which is recorded in a publicly accessible register. An annual administration fee is payable to the Ministry of Economic Development by all registered license holders. As of 2002, most of the available UHF television, FM radio, and AM sound radio frequencies had been allocated. Additional licenses were created, where technically possible, and allocated when there was demand for them. Radio New Zealand, the public radio broadcaster, consists of three non-commercial radio networks: National Radio, Concert FM and the AM Network. It also consists of a short-wave service, Radio New Zealand International, and a news service, Radio New Zealand News and Current Affairs. National Radio and Concert FM are funded through New Zealand On Air and the Ministry of Foreign Affairs and Trade funds Radio NZ International. Radio New Zealand is a Crown entity. The Radio Network of New Zealand, formerly the government-owned Radio New Zealand Commercial, commenced operations as a private radio broadcaster in 1996. Made up of 52 stations, it is owned by a consortium comprising the radio, newspaper, and outdoor advertising group Australian Provincial Newspapers Holdings Ltd., U.S. radio and television operator Clear Channel Communications Inc., and local newspaper and publishing group Wilson and Horton Limited. As of 2002, the Crown reserved AM and FM radio frequencies and UHF television frequencies throughout the country for use by non-commercial broadcasters. AM frequencies have been reserved in all communities with populations of 10,000 or more. Licenses are allocated to appropriate community organizations, which are responsible for ensuring that all interested groups have access to airtime on the frequencies. Use of reserved frequencies is restricted to non-profit activities. Moreover, access radio stations operate on reserved frequencies, and they provide airtime on a non-profit basis to a range of minority groups in the community. In 1999 there were 11 access radio stations operating in New Zealand. The Radio Broadcasters Association (RBA), based in Auckland, represents the private companies operating independent radio stations in all metropolitan and provincial markets, including locally operated, networks and stations. signal distribution, and programming supply. TVNZ is also a transmission consulting service in Australia, southeast Asia, and the Pacific. Since it is state-owned, TVNZ must be socially responsible and provide quality services for its viewers. This responsibility includes providing television programs that reflect and foster New Zealand's identity and culture and are in the overall national interest. TVNZ broadcasts its services to approximately 1.126 million households and has almost 100 percent coverage of the New Zealand population and 70 percent audience share. Its channels broadcast 24 hours a day and seven days a week. The company operates two national channels, TV1 and TV2. TVNZ also has several subsidiary companies. TV3 Network Services, a privately owned free-to-air network which also operates TV4, is 100 percent owned by CanWest Global Communications. TV3 is a broad-based entertainment channel, which emphasizes current affairs, sport, and local programming. TV4 targets urban New Zealanders in the 15 to 39-year-old age bracket and broadcasts to more than 70 percent of New Zealand. Around 2.3 million people can access the channel. for British drama and international sports, for example, rugby, soccer and golf; Trackside, for racing and racing results; and cable television, which offers multi-channel TV and telephone and high-speed data services via HFC (hybrid fiber co-axial) cable. The government has reserved UHF frequencies nationwide for the provision of non-commercial (community access) television services. 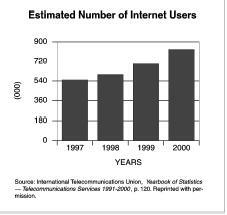 In 2000 there were 1.34 million Internet users and 36 portal providers. There were 12 national Internet press/ media sites and 9 foreign sites based in New Zealand. The leading news and information site, www.stuff.co.nz ., is owned and operated by Independent Newspapers Limited and is a gateway to a wide variety of information as well as their media properties. TVNZ also operates its own web site plus 10 direct or indirect related sites. In 2002 New Zealand had over 110,000 separate Internet domains delegated as their national portion of the Internet DNS. This is up from 242 in 1993 and 47,000 in 2000. Various universities in New Zealand offer courses in or related to journalism. Auckland University of Technology (AUT), School of Communication Studies and Public Relations, for example, offers degree programs in multimedia, radio, and journalism. Taranaki Polytechnic offers a national certificate in Radio Foundation Skills, national diploma in Journalism, and certificates in Radio (on air or business) and in media studies. University of Canterbury and Victoria University of Wellington both offer programs in journalism, as do Unitec and Waikato Polytechnic. Reuters-IUCN Media awards for excellence in environmental reporting. This award is presented to six regions: French-speaking Africa, English-speaking Africa and the Middle East, Europe (West, East, and Central), Latin America and Spanish-speaking Caribbean, North America, Oceania (Australia, New Zealand, Papua New Guinea, Pacific Islands), and the English Caribbean, and Asia. It recognizes excellence in professional reporting on environmental and sustainable development issues in order to enhance public awareness and also to foster a dialogue between journalists and environmental and development experts, that will encourage informative and high quality reporting based on sound scientific data. Regarding sports journalism awards, the Sir Terry McLean National Sports Journalism Awards are presented by the Hillary Commission for journalists in New Zealand. The Hillary Commission's main role is to fund sporting and active leisure organizations and sports clubs in New Zealand. As for awards given only in New Zealand, there is the New Zealand Sports Journalist of the Year Award, the Philips Award for Sports Reporting, Steinlager Award for Feature Writing, the Spalding Award for Best Columnist, and quite a few others. The New Zealand mass media constitute a wide spectrum of print, radio, television, and Internet activities. In terms of broadcast media there are two fairly distinct systems, the one public, in the tradition of the BBC, and the others are in private hands that depends on advertising revenues. New Zealand also has an active Press Council and a respected free press system. The future for the media looks bright. It has one of the freest presses in the world as well as a strong commercial sector in both the print and electronic areas. As of 2002, Some concern remained about the proper role and place of Maori media within the larger context of the shifting media landscape. 1990: Bill of Rights Act passes. 1996: Former Prime Minister Lange sues political columnist for political defamation. 1999: Asian monetary crisis has a negative impact on New Zealand economy indicating Asia's growing economic influence in the region. 2001: TV New Zealand receives new charter. 2001: Ministry for Culture and Heritage announces $1 million fund to promote New Zealand authors and literature. 2002: Television New Zealand bill, to restructure TVNZ as both a public broadcaster and a holding company with two subsidiaries, passes. 2002: Industry and Regional Development Department creates a television and film taskforce to shape an international growth strategy. Burrows, J. F. News Media Law in New Zealand. Oxford University Press, 1990. Calder, Peter. "Commish Turns Org Around." Variety 372, no. 10 (19 Oct. 1998): 66. Day, Patrick. "American Popular Culture and New Zealand Broadcasting: The Reception of Early Radio Serials." Journal of Popular Culture 30, no. 1 (Summer 1996): 203-215. Ellis, William M. "New Zealand Perceptions of America: The Teaching of American History/American Studies in New Zealand Universities." The Social Science Journal 35, no. 2 (April 1998): 245-252. Hazell, Robert. "Freedom of Information in Australia, Canada, and New Zealand." Public Administration 67, no. 2 (Summer 1989): 190-212. McGregor, Judy. Dangerous Democracy: News Media Politics in New Zealand. The Dunmore Press LTD, 1996. "New Zealand." World Press Freedom Review IPI Report (Dec-Jan 1996): 66. Roscoe, Jane. "Documenting the Immigrant Nation: Tensions and Contradictions in the Representation of Immigrant Communities in a New Zealand Television Documentary Series." Media, Culture & Society 22, i3 (May 2000): 344-363. Walker, Peter. "Maori war." Granta no. 58 (Summer 1997): 197-229. Waller, Gregory A. "The New Zealand Film Commission: Promoting an Industry, Forgoing a National Identity." Historical Journal of Film, Radio, and Television 16, no. 2 (June 1996): 243-263. World Press Trends. Paris: World Association of Newspapers (WAN), 2001.